Tender Banana Strawberry Muffins would be a terrific treat for mom this Mother's Day or anyone, any day of the year! 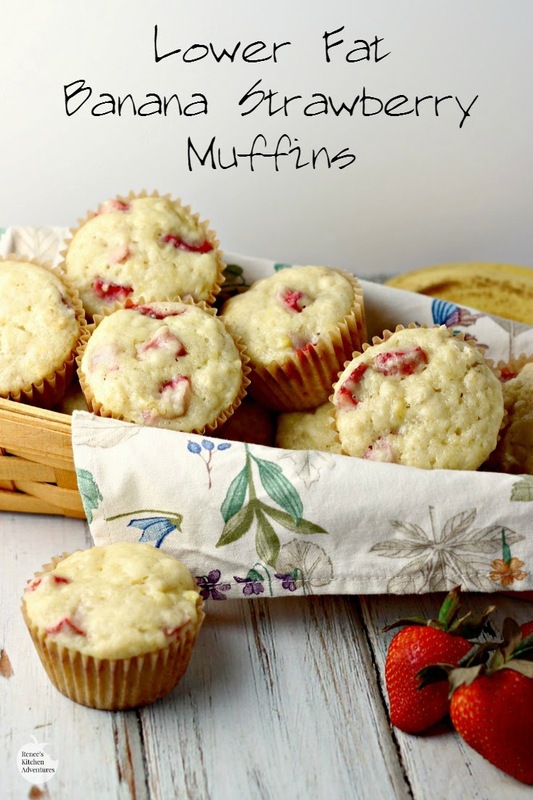 Fresh bananas and strawberries make this muffin moist and delicious. Muffins are such a fun, sweet treat! These muffins are even better because they are diet friendly too! I don't make muffins often enough. They are a great sweet treat to have around because they are perfectly portioned and portable. My husband prefers muffins over cupcakes because he is not a fan of frosting. Me? My sweet tooth goes crazy for frosting, so I'm not a huge muffin fan, but I do like them every now and again...especially if the flavors are interesting like the flavors in this muffin. 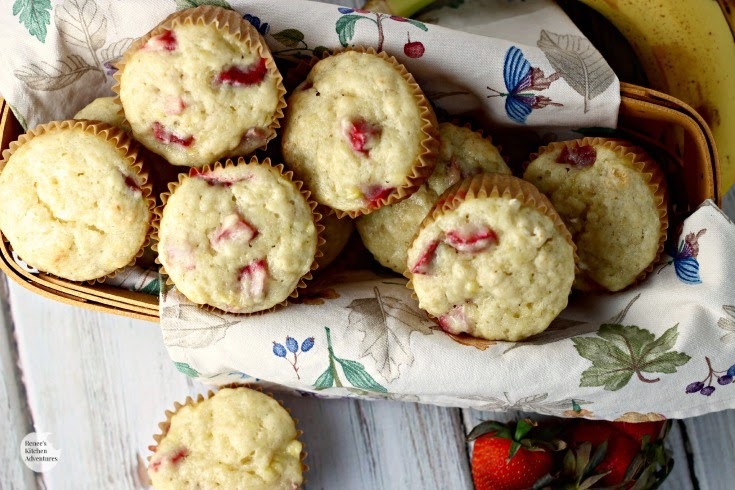 The banana strawberry flavors in these muffins is a classic combination. All the fresh fruit results in a muffin with less need for butter or oil, because the fruit helps keep them moist. These muffins are actually better the next day, once they've had a chance to really meld with the flavors. I'll leave you with this tip...make sure you don't over mix your muffin batter. Less is more when it comes to making muffins that have a tender crumb. 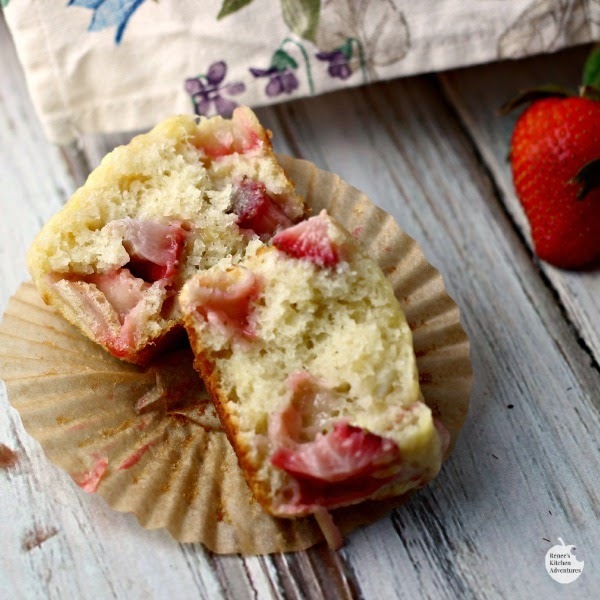 Full of fruit, moist and delicious, these Lower Fat Banana Strawberry Muffins the perfect little sweet treat anytime of the day! Preheat oven to 350 degrees F. Line muffin tins with paper liners or spray with cooking spray. In large bowl, combine the flour, baking powder, baking soda, and salt. Set aside. In small bowl, combine the sugar, bananas, egg, buttermilk, canola oil, lemon juice, and vanilla extract. Add the banana mixture to the flour mixture and mix until just combined. Do not over mix! Toss the strawberries with the 2 TBS of flour to coat and gently fold into batter. Fill muffin tins about 3/4 of the way full and bake for 20 - 25 minutes or until done. so easy to make and so good! I love muffins and these ones look fabulous! I could eat them all day! and they are healthy! thanks for the great recipe! I love muffins, I just don't make them as often as I used to (even though I posted one today too! lol) I love good for you recipes that last longer than a day because with two of us we don't eat them all the same day. These sound amazing. Strawberries are so delicious right now. I also love that they are low fat. Buttermilk in muffins is always the right thing to do - these look so tasty! I always think I don't make muffins often enough too! These ones look so tasty!